Breaking Bad, the notorious AMC series, is currently referred to as the BEST F*(&^% SHOW ON TV EVER! Of course, many other series have been called the same in their day. Naturally I had to find out if the new kid on the block was as good as my favorite crime series featuring a sympathetic anti-hero lead character– HBO’s groundbreaking series, Sopranos. The filmmaking in BB is sublime, edgy and absolutely amazing, but I wasn’t convinced of it’s supremacy in the BFSOTE slot until close to the end of season 4. In fact, I was convinced that Breaking Bad would lose the contest with Sopranos. A few of the episodes in BB felt like a slog. But then the magic held and sustained. My vision of the Sopranos’ heralded position was convincingly challenged as I continued with Season 5 and 6 of Breaking Bad. The result? I call it a tie! Walter White isn’t the incredibly complex character that Tony Soprano portrayed. I don’t love AND fear Walter as I do Tony Soprano. I don’t thoroughly understand Walter’s struggles. But the writing and filmmaking in BB shine. 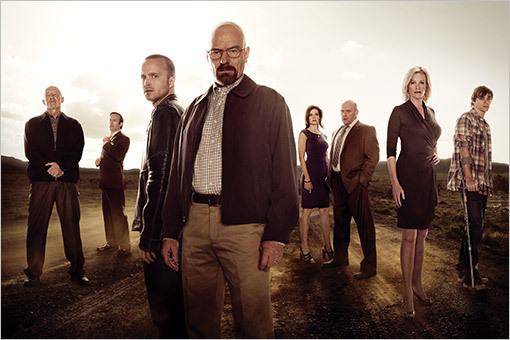 It was close, it was a breathtaking ride, and thanks to Vince Gilligan for the incredible vision. Can’t wait for his next series!